Triveni Menon, Janakraj Bhattrai and I stepped out of the air-conditioned Nair Lab in the Department of Biological Sciences into a sunny and humid day at Colaba. As we moved away from the old seaside building that housed the labs, I smelled a rat – literally. We were near the ‘rodent facility, I was told by the young researchers, before being directed into a smaller facility adjacent to it – Sreelaja Nair’s ‘fish facility’. This is where we would go. To watch zebrafish mating! Having been smitten by zebrafish since her early PhD days at the University of California at Irvine, USA, Sreelaja considered the zebrafish model critical to answer her scientific questions. However, when she arrived at TIFR in July 2012, there was no such ‘fish-facility’ nearby. So first, she had to build her own lab. After working for her graduate and postdoctoral training in fully-functioning labs at UC-Irvine and University of Wisconsin-Madison respectively, she was taken aback when she stared at the derelict room to do her science. It was not only her but the famous Mumbai rains too that had found their way into the lab. It was more than a month at TIFR, and she said “I had no office…my lab did not exist”. Her requests to the concerned officials were cavalierly handled, being told that her space maybe ready only by early 2013 due to impending festivals. Tempers rose. She called for a meeting. “So it ended up being a roomful of middle-aged men and me in the basement of TIFR, where I gave them all a piece of my mind,” she said. Her lab was up and running in November 2012. A feat that she is proud of. “It required every iota of my brain space and physical stamina…and I did no science during that time” she recounted. She even came exceedingly close to painting the walls, she added laughing ironically. Her own personal lab all done, Sreelaja’s next uphill task was to establish the “fish facility” at TIFR. It would take 2 years until the water finally started flowing through this specialised lab. From fishing for suitable land within the campus, sourcing state-of-the-art equipment and getting all the basic hardware and functioning figured out, she managed it all. It is common for newbie investigators to go through such rocky beginnings in one way or the other – the ‘gestation period’ as they call it, Sreelaja said. “You come prepared to get your science off the ground. But initially, you need to do the groundwork. “Each of us has done it” she said very matter-of-factly. As I stepped into the facility I realized I was really in a very sophisticated aquarium. And all the scientific instruments in there were crucial for doing the basic science Sreelaja and her team are interested in. The photo essay below gives us a glimpse of Sreelaja’s and Nair lab’s compelling science, mentoring principles and other activities. Sreelaja’s team works on our very initial moments of life when organisms are only a single-celled embryo. This single cell, in fact, has all the information to transform into the multicellular, multi-organ, 3-dimensional individuals that we all are. After an embryo is formed by the union of sperm and egg, there is a period called ‘transcriptional quiescence’ when the embryo’s own DNA is quiet. During this period, the mother’s RNA and proteins received through her egg sustain the embryo. The mother’s proteins decide when the embryo’s own DNA becomes active. If this activation does not occur at the right time, it drastically affects the position and size of body organs, leading to congenital defects that are often fatal. Her lab tries to pinpoint the mother’s proteins that are directly involved in this process. In this image provided by Sreelaja, you can see a zebrafish embryo dividing ~ 90 mins after fertilisation. 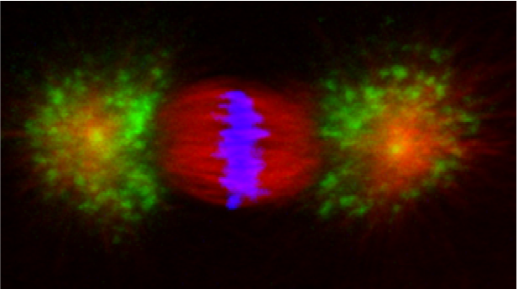 The coloured structures are proteins collectively called mitotic spindle that assists the embryo divide into two. Zebrafish or Danio rerio is a tropical freshwater fish native to the Himalayan region. Since it’s not ethical to study human embryos directly, Sreelaja uses zebrafish as a model organism to study early development. These fish share 70% of their genes with humans. (Above left) Triveni, a PhD student working at the lab holds up a tank to check if spawning, i.e. egg release, has occurred. (Above right) A fish couple at play in a mating tank. Around 100 fertilized eggs can be collected from one couple, 30-60 mins after the facility lights turn on at 9:00 AM. Mating in zebrafish is interestingly dependent on cycles of light and dark. (Left) Triveni and Janak, two researchers in the Nair Lab, spend half their work hours in the fish facility acquiring, handling and working on fish embryos. (Right) The fish facility contains rows and rows of fish tanks. Since it is easy to get confused and mix different fish lines – as they all look the same, the tanks are appropriately labelled and handled with utmost care. Being an aquatic system, Sreelaja installed a facility that recycles 90% of the water used; the remaining 10% contains nitrogenous waste products. “That 10% organic good quality water could in principle be used to water plants at TIFR, ensuring water conservation,” she explained as something she would propose in the TIFR re-development plan. PhD student Triveni tracks the development of zebrafish embryos. To be in control of the timeline of the entire process, she performs in vitro fertilization. (Left) She first anaesthetises the male, collects its sperm that look like shimmering specks under the microscope, and suspends the sperm in a bit of saline (water with sodium chloride). Next, it’s the turn of the female (top right). She anaesthetises the female and squeezes out a clump of her eggs. Finally, she introduces the sperm to the egg in water. And bang! Fertilization! She turns on a timer in a split second, as she collects few embryos at set intervals post-fertilization for microscopy and molecular analysis at various stages. (Below right) The fish embryos are suspended in an embryonic medium in petridishes. The blue tint indicates the presence of methylene blue which acts as a fungicide. These dishes are placed in 280C incubators till the experiment demands. Unlike Triveni, M.Sc student Janak uses naturally fertilized eggs for his research. The beauty of a fish embryo is the ease with which specific proteins can be added or removed and visualised. To do this, he performs embryo microinjections. He has already prepared a series of injection needles for this procedure. (Above left) Although Janak feels conscious as I watch over him like a hawk, his hours of practice hold him steady as he backloads the needle with the injection solution usually containing DNA or RNA. (Above right) The needle up close with the solution near the tip. The solution to be injected has been coloured with a red dye, rhodamine for easy visibility. (Below left) A microscopic view (image provided by Janak) of the embryos he plans to inject before they divide. (Below right) He targets the needle at a specific region within the embryo with a tiny robotic device called a micromanipulator. He depresses a foot pedal and the needle delivers a calculated amount of the solution at optimal pressure. Mentoring forms a crucial part of Sreelaja’s training. She feels grateful for all her past research mentors and tries to stitch together the best practices she learned from all to offer her students. Her lab has regular meetings, where she encourages her students to present their opinions and ideas. Many a time these discussions flow into longer evenings over tea at the cafeteria, as they ponder over science and life. She religiously ensures her students annually attend 3-4 scientific conferences/ meetings and especially give talks to the larger scientific community. She often expresses her philosophy of approaching scientific work – “It’s not a career, it’s a lifestyle choice”, to her students and hopes they will understand one day. Science is difficult and researchers often beat themselves up after failed experiments, but Sreelaja has always known how to unwind. She is a trained Bharatnatyam dancer. During her postdoctoral fellowship at the University of Wisconsin-Madison, she used to travel 90 minutes to another city, Milwaukee to dance every Sunday. “I would train for two hours, then the remaining 6 hours or so I would teach dance. After that, I would come back to the lab in Madison… I absolutely loved it. It was a good kind of exhaustion” she beamed. Today, she ensures her students are not stressed by taking them on outdoor rain walks or have them accompany her and her husband and biophysicist Roop Mallik on weekend treks. Sreelaja insists scientists share their work with the general masses. She says “people deserve to know where their tax money is going”. Recently, she delivered a talk at Kitab Khana (bookstore) as part of Mumbai Local, a monthly gathering where artists or scientists are invited to share their work with the public. Amazed at how curious people were, she also had a session at Prithvi Theatre (Mumbai), as part of Chai and Why, TIFR’s very own outreach program. This is part of a series of profiles of Indian women scientists whose research has been funded by Wellcome Trust/DBT India Alliance. We are thankful for a grant from India Alliance towards this series that has allowed us to invite voices of fellow science writers on this project.